Wow! That is quite a title huh? I decided to put all that in the title in hopes that this would be easily found by anyone searching for Wheel Of Time (WOT) nail art. I couldn’t find any when I Googled it although I know I have seen something somewhere a long time ago. If you have read the EPIC 14 book (plus a prequel) series by Robert Jordan then you can probably interpret and enjoy this design easily. But in case you have not, I’ll give you a brief explanation. In the WOT world, the Amyrlin Seat is basically the queen of the whole world as all kingdoms bow to her and submit to the will of the “White Tower”. The White Tower is where all women who can channel (do “magic”) go to be trained and when they graduate to a full fledged “Aes Sedai” they pick an “Ajah” based on their personal preference. Each Ajah goes by a color (Brown Ajah, Grey Ajah, White Ajah, Red Ajah, Yellow Ajah, Green Ajah and Blue Ajah) and they dress according to their Ajah’s color. The Amyrlin is head of all Ajahs. She is “from all Ajahs and yet of none” and to symbolize that, she wears a stole with a stripe of each of the 7 Ajah’s colors. That’s where I came up with the stripes. The accent nail is “The Flame of Tar Valon” which is the official symbol of the Amyrlin and the White Tower. That is just a tiny bit of info about the series. It is a REALLY long story! I imagine if you haven’t read the books then this won’t be much of a manicure to you. 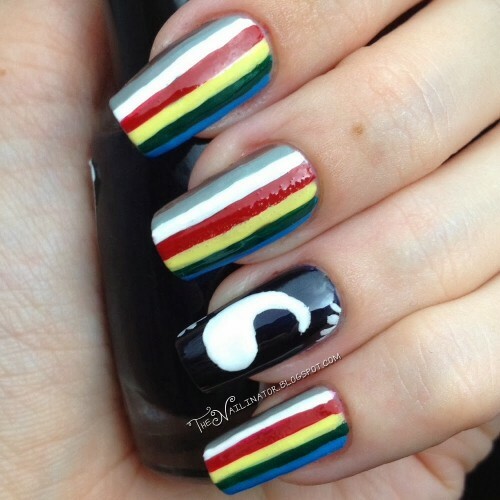 But, even if you aren’t familiar with the MASSIVE back story behind the inspiration of these nails, consider how hard it was to free hand these stripes. Ha! It did take a while and I know they are not perfect. I planned to do both hands but it was so late after I finished these that my Cinderella hand just got skittles so I could get to bed at a decent hour. Then my topcoat bubbled in the middle of the nail. Oh well, sometimes topcoat kills the mani. I struggle at times to float the brush to avoid smudging and to avoid bubbling at the same time. That’s all for now. I meant to get this up on Saturday but time got away from me. It tends to do that with two kids to run after. I hope you all have a great week. Can I say, even if I’m not a huge fan of the series (I’ve only reached book 10, I believe), I still geeked out on this manicure? So awesome!! Huh, I’ve always meant to read the series but 14 books was just a little… yeah. This looks amazing, though! 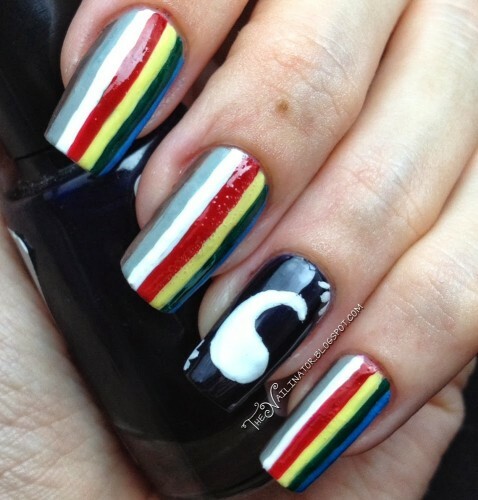 I love the accent nail and the stripes look perfect! I am a fan of the WoT series, having read them all except the last one more than three times. I have to say it was so nice to see something inspired by the series, so nice!